I've been asked to put a sticky on here to help those of us who either want to start growing in polytunnels and greenhouses, or those of us who already do. So I will add links to interesting sites and information, and perhaps put down some of my own experiences of my last 4 seasons growing under glass and polythene. If you have anything to add, please put a thread on here, and I can add it to this sticky. This was my first and tidiest growing season! Thanks for reminding me about this post RG, just lately I've been getting carried away talking about chickens! Oh yes, polytunnels are good as a winter dust bathing area for chickens too!! My small tunnel will go up soon, so can you tell me please ...when do i sow cobra beans for growing in large tubs inside it? I am also going to grow a couple of squash, as they did so badly outside last year......... so will i have to hand pollinate them? Hi Mumofstig, I usually put things in the greenhouse a month earlier than I do outside. I have grown some beans and peas in my polytunnel, and they did reasonably well, but not as good as those outside, probably because I sometimes forget to water them enough! I think to get better pollination of your squashes in there, yes hand pollinate them, but with the door open, you will still get a fair amount of bees and other things buzzing around in there. 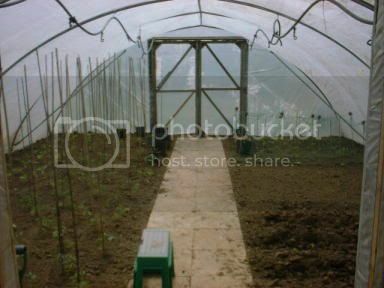 I'm not an expert on polytunnels though, just got asked to do a sticky as several people know I have one of my own! lol. Mainly I grow tomatoe and chillies in mine, with a few odd things like cucumbers and anything left over from outside. I even grew some potatoes in the one year. Yield wasn't as good as outside potatoes, but there was no scab or anything on them!!! I dont' usually hand pollinate anything, but then my last lot of melons in the polytunnel didn't do very well. Whilst watching the poultry video on The Garden Channel yesterday, i also noticed this one on polytunnel growing, made by First tunnels, so I thought I'd put it in here. someone may find it interesting! Unfortunately, after Brian giving his workshop up to the turkeys 2 years ago, my lovely polytunnel is now his workshop and storage facility! He has his table saw in there, dust extractor, rotovator, lawn mower, all his odd bits of plywood and all the bits of wood he is cutting up for the winter! oh and a workbench! No room for my stuff at all!